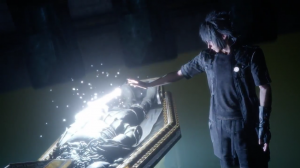 This page contains a detailed walkthrough of Chapter 10 – The Heart of a King in Final Fantasy XV, including quests, objectives, items, enemies and bosses encountered in the game. 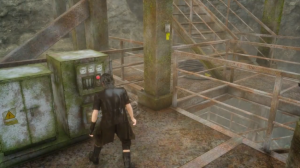 After the cutscene ends, you can walk around the train to explore and look for hidden items. There are several items that you can find on the train. Hi-Elixir – Head to the south of the train and you will find this item before going inside the train’s bar. Remedy – At a table in the bar. Graiean Medal of Distinction – Behind the door to the south of the bar. After a certain time, the train arrives at Cartanica. Once you arrive at Cartanica, use the elevator to the north to go down the mine. 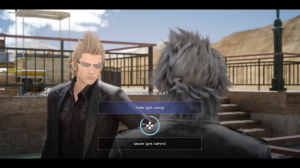 Ignis will ask you if you are ready to go (Take Ignis along, Leave Ignis Behind). 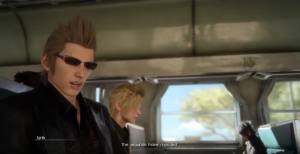 No matter what choice you make, Ignis will still be coming with you. 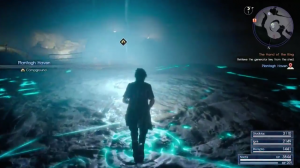 Ignis walks slowly, so you also have to move at a slower pace for Ignis to catch up. Gladiolus will warn you if you stray too far from the party. Move forward to go down the mine. 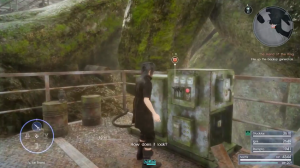 There is a Hi-Potion near the wire fences and a pool of water to the south before going deeper down the mine. Rough Scales can also be found on the slope behind a tractor. There will be some a pack of Gurangatch at the large pool of water. 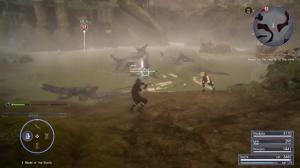 Keep an eye on Ignis as he is very vulnerable to attacks. After defeating the monsters, head towards the quest marker, then proceed northwest. Head west down the mine and keep moving until you reach a roadblock. You have to fire up the backup generators to remove the blockage. Proceed east to the control panel and inspect it. You need a key to activate the panel, so you have to head northeast to get to the shed where the key is. There is a split path once you go down and reach a pool of water. Proceed to the left path if you want to obtain some items. Star Pendant – Climb the slope to the left before heading north towards the set of stairs. Mega Elixir – Go up the stairs and head to the right. Go back to the pool of water and now proceed to the right path. There are also some items that you can get before reaching the shed. Strong Bone – Below the second set of stairs once you go up the first set. Mega Phoenix – Reach the top of the slope after going up the second set of stairs. Once you obtain these items, go back down the stairs and head east. Defeat the Snagas that will appear. In a few meters before reaching the shed, there will be a Pantagh Haven on the left path, proceed to the area to camp and rest. After camping, head to the shed. There are some Falxfangs on the way, so you have to defeat them to get the key. Once you have the key, head south to get to the control panels that will fire up the backup generators. Before you get to the control panels, there are some Falxfangs that you need to defeat first in order to proceed. After the battle, get the Splendid Building Stone located at the top of the slope to the east. Move forward after obtaining the item. There is a Gigantoad that you need to battle before powering up the first control panel. After switching the first panel on, climb down the stairs and you will see the second panel, then switch it on. Now, you need to return to the main control panel. 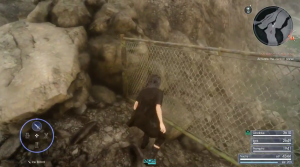 Go back up the stairs and proceed to the west for a shortcut, leap over the wire fence where the Hi-Potion was located and then head down again. The pack of Gurangatch will respawn, so you need defeat them again to proceed. Switch the main control panel on and proceed to where the roadblock was. 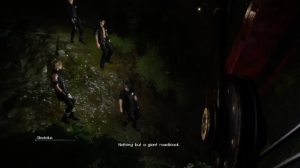 Once you’re at the site of the roadblock, a cutscene commences. 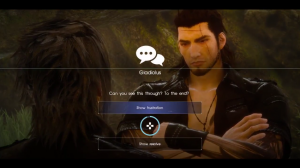 Gladiolus will ask you a question (Show frustration, Show resolve). 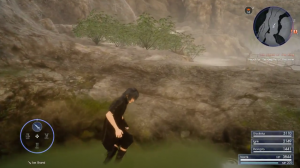 Any choice will give Noctis a 50% increase in physical strength. After the cutscene, head towards the quest marker, and once you’ve reached it, a boss battle commences. The Malboro is infamous in the Final Fantasy series to inflict multiple status ailments at once with it Bad Breath, which could easily kill the party members because of its crippling damage. To avoid Malboro’s Bad Breath, make sure to warp away from the enemy after striking several hits, do not stay long near Malboro. 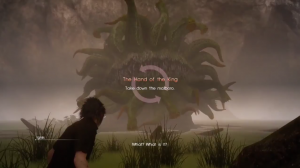 Also, since Ignis is injured, be sure to keep an eye on him while fighting Malboro. Once Malboro is defeated, proceed to the tomb and obtain the Katana of the Warrior. A cutscene occurs after receiving the weapon. Head back to the train after the cutscene ends.